A text is a set of interacting variables and data sets. Narrative theory dovetails quite nicely into game theory and computer science. A core variable/node of data interacts with a sequence of other dynamic variables/data nodes. Just walking two blocks to the store to buy a soda is a similar construct. The person walking is variable X. All the cars on the roads are variable set Y. All the animals on leashes or not are variable V. The weather/environment/immersion is variable set Z. Does it suddenly rain? A great flash of lightning? A gust of wind? The cars may run smoothly, or one may run that red light or stop sign. There is that possibility one dog may get loose and cause a panic, distracting a driver. The return home with a soda completes the “game”. A narrative is a similar mathematical construct of dynamic variables and their interaction and equation. It is also a game logic in the same vein. The main character (C) encounters, say external variables (e1,e2,e3,e4) thus triggering the interaction of internal variables and conflict (i1 and i2). The end-point ceases with the character completing or not completing these interactions/conflicts leading to a tension shift and perceived outcome. This of course is an oversimplification of the great trees of narrative forms for example. A character in a narrative is a construct of details, data and even often psychology. Each character has a different set of personality traits, behaviors and at times even desires, wishes and a sense of prescribed self. In narrative theory the distinction is clear between a “flat” and “round” character. The flat character is not desired as it is one dimensional and lacking the motivation inherent and in stasis in a round character with contradictions and conflicting wishes, regrets or desires (arguably the human condition in essence). The round character is imperfect and has flaws and strengths, wishes and doubts in tandem. The character thus awaits the internal and external conflicts to cross and explore in any narrative. In the Alkane series in Organic Chemistry an interesting analog occurs. The carbon or carbons are complicated and engaged by Hydrogen. The core reacts to the interaction. Fascinatingly, there is a symmetry in each interaction set and a cohesion. This is a strong model for narrative in comparison. A main character or characters interact with the complications and added dynamics/elements of other packets of data and must respond. The story emerges from the emergent pattern(s) found as those interactions occur. The Alkanes shift gas to gas with totally different gasses emergent from the internal interaction patterns of their carbons and hydrogens. An exciting thing occurs when seeing this overlay along narrative theory. Can stories be made to shift their internal cores beyond the author’s initial construction? What if a narrative work is made then let go to form from interactions in the data sets the author has put forth independent of each other and the story does not always emerge in the same way? What if it then “learns” independent of said creation? Can a logic engage and react to a process? Isn’t this still the act of creating and writing? In Alkane series each is a gas with a coherent sense of whole and complexity of parts to the whole. The different gasses in the series have a different balance each of Carbon to Hydrogen and yet each is a specific gas. This is a small dip into organic chemistry but relevant as it is a strong analog to narrative theory, game theory and the internal architecture of parts to a whole in a narrative. A text can have one initial core character and say four conflicts that must be processed with the narrative. It can be shifted to more complications and more primary characters and if done well can still have a sense of a specific end narrative and space. This model moves away from the dead ends of random generating texts or of parts shifted in a work that will simply break into nonsense. It is really amazing that text works at all. A short story is especially so. In a short span a world is created, the reader or viewer is immersed in this world, has faith in it even if it is far out of their experience or is even fantastic. The short work has characters that have a depth and complexity and move through conflicts that can be moving to read or observe, perhaps even teaching on the personal and universal and in the end conveying some deeper message or idea transmuted to the reader without being stated (theme). This all also occurs with the readers or viewers each coming to the work with a unique perspective, taste, related memories and experiences and aesthetic and critical taste/bias. The author builds a work of parts connected with great complexity hopefully seeming seamless to the world with each possible person experiencing it to potentially be put off, not relate or even turn away. If three Semioticians spent a one-month residency writing a book about an airport would each come out the same? This is highly unlikely. One may see the descending forms, night across the runways and aging architecture as death as a symbolic/representative system and connected elements. Another may complete a book of the same as birth and focus on light in the mornings, the rising planes into sky and even the aging architecture to be rebuilt anew over time. The third would likely see something else entirely. This is not a negative comment at all on Semiotics, but rather again the concept of text and its ballast as something fluid, plastic, full of an anxiety and not a pure singular form or meaning. Again, there is great beauty in this and much to be explored. Basic cellular Biology finds things like skin healing from wound in a process from small to large scale as a system and the ability of cells to be self-aware in the sense of a sort of damage control within small to large cellular clusters and forms. Applying this to text again leads to intriguing questions and possibilities. Can a textual work self-check and assess over time after being initially created? 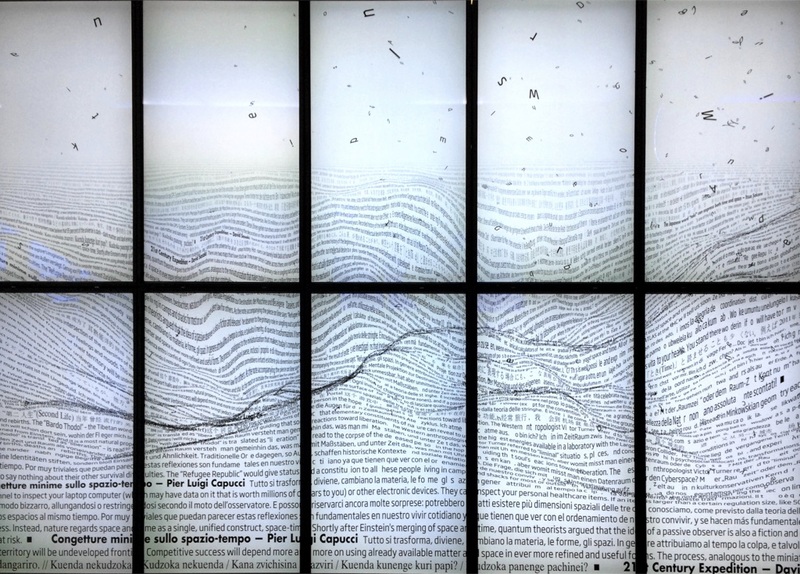 Instead of hypertext or crashing outside data sets to a text as many works in art in e-lit have done well in the past, what can happen if the innards of the text interact, assess and reform based on prescribed logic strands and even its own volition and sense of need? This opens up elements of internal interactivity from a text not ever having certain parts static to the wilder ends of self-aware text moving from any authorial control over time. The possibilities are wide and resonant. A novel long in the canon like The Great Gatsby is not a finite, “finished” and impenetrable satellite by any means. It was ceased. If any text functions like a game and its interacting variables and like the shifting bonds in chemistry, then these books are swarming masses of variable sets that were ceased at a certain point. There are hidden dormant chapters in these and all books and “finished” texts. What happens to the other main characters now that Gatsby has died in his pool? Where will they go? What will they do? How will the town respond? These variables and others are just waiting to tell their tales from their dataset interactions and narrative beyond that last page so long seeming the end. The text could thus in a sense write itself out from that pool and seeming end. This all may be done with artificial intelligence or machine learning, but other areas are very interesting, if not more so. Another possible approach is in kernels of data, of packets like the elements of character, setting, internal and external conflict and what happens with them. The text itself is a binary sequence, is code, is form malleable made from colliding and adapting elements. The primary thread is that text is never static, a work is never truly finished, and textual works have great capability to learn, adapt, self-reform, to shift and to even in a sense emerge from perceived dormancy and evolve. If the text is set with kernels with core data sets able to process interaction, then a self -evolution and generation is even possible. Any existing text is a code as it is utilizing text. An existing story is a set of interacting internal dynamics as per the internal dynamics of narrative and parts to a whole. The functionality of a letter to a word to a paragraph to a page to a longer work is also an architecture. Text is also open to varying interpretation, modes of reading and the symbology and psychology interpolated in the mind of each person reading. The long ago published book holds game theory inside as well and the quantum slippery nature of parts to a whole. It holds the math equations of movement, environment, interactions, collisions and even avoidance mechanisms (does the character avoid the decision or action due to previous negative action results be them external or internal?) in a narrative space. Books hold sleeping dormant chapters. All do. At the same time, it is possible to construct a new narrative that has internally encoded data sets (annoyed, perturbed, angry, enraged = shades of one word and concept and also mathematical spaces and definitions: 10, 20, 40, 80 out 100 for example). A text can internally be encoded with slippery plasticity with such value sets laid within. A chat with this sensitive text can engage the text body based on certain textual triggers from the reader/observer. The text may become sensitive in certain areas and thus contract. It may become anxious and alter its paragraph order. It may engage the return reader/viewer and sensing interest, expand otherwise unseen text, thus changing its “body” and engaging back to the reader in a conversation over time. Text is not static, only seen in a perceived stasis.